Design a unique mother's ring in gold customized with names, dates, words ~ use your imagination to create your own custom ring for mom! The listed price is for a size 4.The price will increase if you order a larger size. Mother's rings have never been so special. 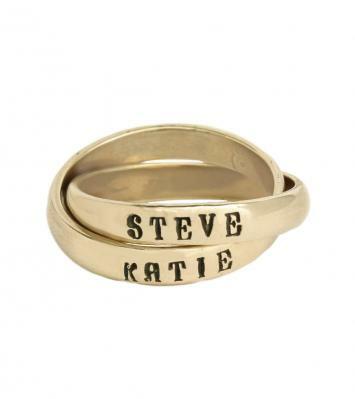 Personalize this unique ring with the names of your child(ren) and forever have them wrapped around your finger! For the mother of two and put a name on each band for a perfect gift. Or if you just have one child put the name on one band and birthdate on the other. More than 2 kids? Put two names on a band separated by a heart or bullet. I absolutely adore my new ring with my children's names. The Tri color(yellow gold, rose gold, silver) is the perfect ring to wear everyday as it goes with everything!!! As my children grow older and leave the nest, it's nice to have that constant reminder that they are still very close to me!